A dense tree or shrub with small, sharp thorns, hawthorn grows up to 25’ tall. Clusters of small, white, rose-like petals appear in May, leading to bright red berries in the fall and remain on the tree until winter. The berries resemble tiny apples. The laevigata variety is native to Europe and North Africa where it has been used medicinally for thousands of years. Today it is most famous for its tonic effect on the cardiovascular system. It is a safe, versatile, delicious herb with a rich history of use and lore. Uses: As a cardiotonic, the berries act in a normalizing way upon the heart by either stimulating or depressing its activity depending on the need. It improves the nutrition and energy release in the heart muscle, strengthening it without stimulating or depressing activity. It helps maintain healthy arteries, veins and heart by enhancing the connective tissue structure of the endothelial lining of the heart, blood and lymphatic vessels. This gives these structures resiliency against injury, disease and the normal wear and tear of aging. Hawthorn also has a normalizing effect on cholesterol, lowering unhealthy cholesterol levels, and helps to dissipate clots. Taken regularly, hawthorn can prevent the development of coronary disease. These uses are relatively modern. Historically Hawthorn was used in Europe for kidney and bladder stones and as a diuretic. The berries were used for diarrhea. in Chinese medicine, hawthorn berries are mainly taken for symptoms of ‘food stagnation,’ which can include abdominal bloating, indigestion, and flatulence. They are believed to move blood and are used to relieve stagnation, especially after childbirth for postpartum abdominal pain and clumps due to blood stasis. Indications: angina, coronary artery disease, weakness of the heart, irregular heartbeat, hardening of the arteries, artery spasms, hypertension, hypotension, congestive heart failure, hemorrhoids, varicose veins and heart problems caused by hepatitis or other liver disease. Mental indications include attention deficit, restlessness, irritability, anxiety and nervousness. It is also indicated for allergies, sinusitis, colds, asthma, and food stagnation leading to fermentation and indigestion. Contraindications: Hawthorn may be taken over long periods of time, as there is no risk of toxicity. It does make the body more sensitive to digitalis and should not be used concurrently with digoxin. Prolonged use can lower blood pressure; people using blood pressure medications should take care that their BP doesn’t drop too low. History/Folklore: In England, the branches were used for the maypole. While a propitious tree at Mayday, Hawthorn is at other times considered unlucky.The flowers are reputed to have magical properties, and are believed to bring about a death in the family if they are taken into the home. This may have something to do with the trimethlamine present in the flowers—this substance is one of the first products formed when the body starts to decay. Many country villagers believe that hawthorn flowers still bear the smell of the Great Plague of London (the flowers are mostly fertilized by carrion insects which are attracted to the smell of decomposition). A tree sacred to the faeries, Hawthorn is to be regarded with respect, as it stands at the threshold of the Otherworld. Some warn that one who falls asleep beneath a Hawthorn will be taken to the faery realm. Hawthorns often stand over holy wells, also traditional thresholds of the Otherworld. Hawthorn is reputed to have provided Christ’s crown of thorns, as he faced his decent into hell to pay for the sins of humanity. Some believed witches rode on hawthorn brooms, as they made their journeys between realms. Despite these seemingly negative associations, there are also traditions of placing sprigs of hawthorn above cottage and stable doors to keep witches out. In some places, to sit beneath a hawthorn afforded protection from the same (‘Creep under the thorn/It will save you from harm’). 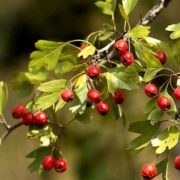 In either scenario, hawthorn seems to be respected as a powerful plant with otherwordly connections. Perhaps these judgments about evil and witches and danger come from a lack of understanding about the nature of darkness, and the lessons and insight that can be gained from a metaphorical visit to the underworld, a sojourn to the subconcious realms, of the many forms of death and release that are necessary to allow for new growth. This is a great time of year to go to those dark places within ourselves. We do this, ultimately, so that we may connect more deeply with spirit, with the metaphysical backdrop of the world. Perhaps Hawthorn is one plant that can aid us in our journeys to become more whole. more conscious and spiritually adept beings.